Let everyone know how much YOU love Skin Trip! Eco-friendly T-Shirt is soft, comfy and only $15 … order now. 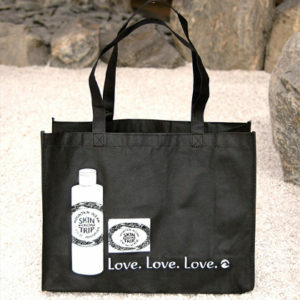 Roomy tote bag, only $5 … order now. What People Are Saying About Skin Trip! Lip Trip Fans Sound Off! Best lip stuff ever! Stays on a long time, does not clump or cake, has no taste, and makes my lips look and feel normal. Few lip balms have SPF protection. This one does, 15, and has a bees wax base. It is the very best and I never go anywhere without it in pocket. I ve used this product for 7 or 8 yrs … very very good for cold weather or hot … neutral taste and stays on a long time. This is really just the best lip protector. If you use it you will never get chapped lips, and if your lips are chapped and you apply it at bedtime, your lips will be healed by morning. If mountain ocean ever ceases to make lip trip, i will die. I have been using lip trip for many years now. I have severely dry lips and this is the only product (and believe me I have them all, some $100) that works for me. Free from the tyranny of chapped lips! All my life, my lips have been prone to chapping, but things had gotten desperate for me.… Finally, I tried Mountain Ocean’s Lip Trip and have never looked back. I’m free at last from the tyranny of chapped lips! This is such a GREAT product. Do have no need to reapply nearly as often as any other product on the market. I hope this is always available! Move over Burts Bees this is THE HOLY GRAIL of lip balms. I found this in a natural market i happened upon in Colorado while traveling cross country. I ride a motorcycle and my lips get very dry and cracked, but not anymore cause Liptrip is the shiznit! Get some! i love this brand. has a nice consistency, pleasant but mild taste. sun protection, too. and the price is reasonable. This is the only moisturizer I use on my lips, and it’s really dry here in Las Vegas. I’ve been using Lip Trip for about 6 years and it’s the best for keeping my lips moisturized and smooth. Feels great on lips, long lasting, and entirely worth the price. Heads and tails above Chapstick. Couldn’t live without it. I have used this product for over 20 years and nothing else comes close to keeping my lips moist without being sticky in the dry Colorado air. I have trouble finding it locally and was super happy to find that I could buy it online. A little expensive, but def. keeps my lips protected from cold. I don’t have chapped lips anymore – not in the bitterest cold! it goes on thicker than most other lip balms but it keeps your lips from getting chapped longer than other lip balms. definitely a good stocking stuffer or gift to someone who always has chapped lips. would definitely buy again. it goes on thicker than most other lip balms but it keeps your lips from getting chapped longer than other lip balms. definitely a good stocking stuffer or gift to someone who always has chapped lips. would definitely buy again. – Greg C.
I don’t like scented lip balm! I don’t like scented lip balm! Lip trip is the best, it’s natural, not too hard or soft. The price is OK, and it didn’t take forever to arrive. In sunny florida “Lip Trip” is a must. No one likes dry or cracked lips. They don’t look good and don’t feel good ! More heat and sweat resistant than most. This lip balm seems more heat and sweat resistant than most. So it doesn’t soften when carrying it all day while cycling, and stays on your lips once you put it on. Been using for years. No scent, lasts for most of the day, much better than Chap-Stick. For 39 years, I have used Mountain Ocean Lip Trip. It is the best lip product I have found and for me, it is a MUST HAVE!! After paying over $20 for some fancy chapstick at Sephora, I finally had enough and researched to find this. Woww. This stuff is amazing. Really stays on and MOISTURIZES without drying out. No petroleum so it heals and protects over the long term. Will buy more!!! Best stuff on the market…. long-lasting protection when surfing and snowboarding! and great around town. My lips are always chapped no matter what and this is the least chapped they’ve ever been because of this product. The best I’ve come across so far. First found it in CO. The best for me. Hope they never stop making this. As someone who lives in the high altitude desert, I depend on Lip Trip year round. It is hands down the best lip moisturizer/balm I have ever tried. It is similar to the legendary Burts Bees classic peppermint lip balm in effectiveness, but even better (and with SPF protection!). My “got to have” lip balm! This Lip Balm was at the checkout stand in a grocery in the small town of Langley, WA, where it was sold as the “got to have” lip balm to help and heal chapped lips. It is now MY “got to have” balm when the weather dries my lips so thoroughly that nothing else helps. Thanks for a great product! Best Lip FIX! I’m addicted – I know I know looks like another ch**stick or lip balm. Great consistency – grabs on the lips – no smear or mess. Simple barely there scent – not smelly. SPF – I use this on the beach and last week on the mountain. I have loved Skin Trip’s lotion for years. Just bought this lip balm and couldn’t be happier. Smooth feel and lasts a long time. WOW! I bought this because it said something along the line of “for Colorado dry lips”, which is what ails me. I have tried everything, EVERYTHING, and this is the best product ever! Very few applications and in a day’s time I feel like my hopeless lips have been healed. THIS IS IT! I’ve been using this for over 30 years. Nothing else performs like it. Dry chapped lips are a thing of thee past. Great product. Good protection from the sun without any flavor or scents. Awesome Product – Won’t Live Without It!! This product has been available for 35+ years. It is superior to any lip product I have tried. Stays on for several hours before more is needed. This company makes five other great skin products for adults. Why would you use anything else? A bit thick but not too thick and I don’t need to keep going back to use it throughout the day. Why would you use anything else? A bit thick but not too thick and I don’t need to keep going back to use it throughout the day. – Kyle A.
I have used this lip balm for many years. It has natural, simple ingredients and no scent or color, so my own healthy lip color shows and is moisturized and protected from chapping. Best lip balm I’ve ever found. Quality ingredients with no junk. Gentle beeswax formula that lasts and protects, but doesn’t have any strong flavor like most other brands. Absolutely, bar none, the best lip treatment on the planet. Best lip balm of all time! The best lip balm ever made, hands down. My idea of luxury is to have a twelve-pack of this stuff in my bathroom cabinet. Have used Lip Trip for many years, but have tried countless other lip balms. Covers well, stays on a long time, and has no greasy feel like many petrolatum (petroleum jelly) based products. Has only the mildest scent and flavor, not overpowering. I highly recommend this lip balm. This was my favorite lip product, so glad I found it again. I hope you keep selling this product. It stays on lips and protects them. Lip trip stays on for hours unlike lesser lip balms. I’ve never found another brand which works as well. The only lip balm that works for hours and doesn’t aggravate my allergies. Lasts for a very long time; stays ON my lips. Used this for years … price is lower than the one place in town that has it. The only lip balm that works for hours and doesn’t aggravate my allergies. Lasts for a very long time; stays ON my lips. Used this for years … price is lower than the one place in town that has it. – Carol K.
Picked some of this up last year in Denver and have been addicted ever since. Hands down the best I have found for watersports and outdoor activities. this stuff works, and after a couple days use my chapped lips are 100% again. best chapstick on the planet! great for a guy, i like it because it leave a matte look on my lips as opposed to the shiny wet look of other random lip balms … but seriously this stuff works. Sign up for our newsletter! We will contact you from time to time with news and fun stories about Skin Trip’s adventures!